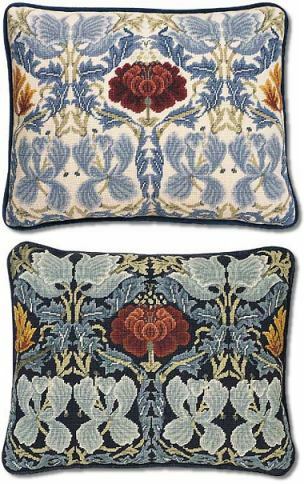 Tulip & rose was designed by Morris in 1876 and could be purchased through his shop in Oxford Street, London. It was produced as heavy triple woven curtaining - perfect for draught-proofing large Victorian houses; the dramatic colouring also gives visual warmth to a room. Original fabrics are at Standen, the McCord Museum, Montreal and the Art Institute, Chicago. Beth Russell has adapted Tulip & Rose with a choice of two background colours; ivory and dark blue. The kit uses Appletons wool on 12hpi canvas and measures 15" x 20" (38 x 51cm). The canvas measures 22" x 26" (56 x 65cm) making it suitable for covering a chair by purchasing additional wool of the background colour.